The self portrait in its most potent form offers the viewer with a direct insight to an artist. On an superficial level we are granted a glimpse of the artist’s face. For the viewer it is interesting, exciting, and dynamic thing to be afforded this opportunity, as I believe it adds unconsciously to our perception of the artist. But why certain artists engage in this practise so frequently is a tricky one to answer. Is the self-portrait an exercise in convenience (no easier/cheaper model to arrange than yourself) or vanity? With the self-portrait then perhaps it is the artist’s job then to arrange this ‘accidental and unrepeatable combination of features’ into a true expression of self. Using this, I’d like test the model against three artists generally perceived to be among the best self-portraitists: Rembrandt, Van Gogh and Frida Kahlo. Rembrandt is undoubtedly one of the greatest masters of the self-portrait. Producing over eighty paintings of himself, he arguably engaged in this form of self-analysis more than any other. The thing that strikes me most, however, about Rembrandt’s self-portraits is the lack of distinction between most of his paintings. 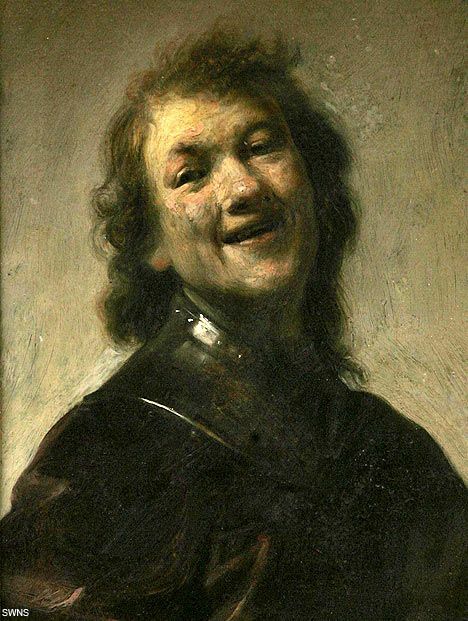 Some of his sketches aside and discounting the very charming Rembrandt Laughing (above), his paintings often capture the same kind of pose against an unchanging dark, smoky background. Despite his technical brilliance, Rembrandt’s self-portraits seem to serve more as an objective offering rather than revealing a glimpse into the artist’s soul. Maybe I’m just a sucker for a bit of colour in a painting but Van Gogh in contrast seems to offer the viewer a much more varied perspective of himself. From full beard, to no beard, to shaved head, to wearing a funny hat, and right through to zombie Van Gogh (see the 1887 self portrait, above), he seems to offer a much wider perspective of himself, and therefore (in my opinion) had more reason to commit so many self-portraits to canvas. Haircuts aside, however, Van Gogh’s paintings offer a vivid glimpse into the painter’s mind. His wildly different colour palettes for instance seems to serve as an indicator of his moods or mental state. Most poignant for me perhaps, are his two bandaged paintings; to think that even in the midst of such an unstable state, he committed to painting himself is a testament to his dedication as an artist. Following directly from this, we have Frida Kahlo, whose pains and struggles are well documented (for our own reaction check out an earlier blog here). She was a victim of polio as a child and following a bus crash in her late teens, endured prolonged and intense periods of pain throughout her life. As with Van Gogh, Kahlo left us with a lasting chronicles of her struggles in her self portraits. From the haunting Two Fridas through to the iconic Broken Column, these offerings reveal Kahlo as a fearless painter. Escaping the boundaries of the conventional self portrait, she allowed surrealistic elements to enter the fray, giving us a extraordinary and unbounded glimpse into her psyche. What emerges from these paintings is a sense of woman who suffered both emotionally and physically, yet endured these afflictions bravely, using her craft as a form of catharsis and self reflection. Perhaps there’s an element of buying into the suffering artist model that endears me more to Kahlo and Van Gogh than to Rembrandt’s plainer and more sober self-portraits, but in any case each of the artists displayed their own mastery of the form. If you’d like to investigate the self portrait a little more, the Art Gallery of Ontario has a Self Portrait exhibition containing paintings from the likes of Rembrandt, Käthe Kollwitz, Max Beckmann, Cindy Sherman, and Joyce Wieland. If that’s a little too far afield we’ve got books on Van Gogh, Kahlo and Rembrandt containing some of the artists’ bravest and best self portraits. Think Rembrandt reigns supreme? Van Gogh over-rated in your eyes? Kahlo just doesn’t do it for you? Why not share your thoughts in the comments section below.